substantially reduce noise levels for people living next to highways. A sound occurs when an ear senses pressure variations or vibrations in the air. Noise is unwanted sound. The brain relates a subjective element to a sound, and an individual reaction is formed. Numerous studies have indicated that the most pervasive sources of noise in our environment today are those associated with transportation. Highway traffic noise tends to be a dominant noise source in our urban, as well as rural, environment. 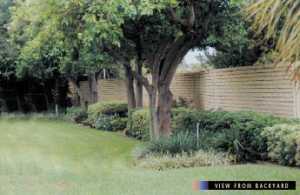 Noise barriers are solid obstructions built between the highway and the homes along a highway. They do not completely block all noise they only reduce overall noise levels. Effective noise barriers typically reduce noise levels by 5 to 10 decibels (dB), cutting the loudness of traffic noise by as much as one half. For example, a barrier which achieves a 10-dB reduction can reduce the sound level of a typical tractor trailer pass-by to that of an automobile. Barriers can be formed from earth mounds or "berms" along the road, from high, vertical walls, or from a combination of earth berms and walls. Earth berms have a very natural appearance and are usually attractive. They also reduce noise by approximately 3 dB more than vertical walls of the same height. However, earth berms can require a lot of land to construct, especially if they are very tall. Walls require less space, but they are usually limited to eight meters (25 feet) in height for structural and aesthetic reasons. When Are Noise Barriers Required? Noise barriers are not always required at locations where an absolute threshold is met. There is no "number standard" which requires the construction of a noise barrier. Federal requirements for noise barriers may be found in Title 23 of the U.S. Code of Federal Regulations, Part 772, "Procedures for Abatement of Highway Traffic Noise and Construction Noise." The Federal Highway Administration noise regulations apply only to projects where a State transportation department has requested Federal funding for participation in the improvements. The State transportation department must determine if there will be traffic noise impacts, when a project is proposed for (1) the construction of a highway on new location or (2) the reconstruction of an existing highway to either significantly change the horizontal or vertical alignment or increase the number of through-traffic lanes. If the State transportation department identifies potential impacts, it must implement abatement measures, possibly including the construction of noise barriers, where reasonable and feasible. Federal law and Federal Highway Administration regulations do not require State transportation departments to build noise barriers along existing highways where no other highway improvements are planned. They may voluntarily do so, but they are solely responsible for making this decision. How Is a Noise Barrier Funded? There are no special or separate Federal funds for highway traffic noise abatement. State transportation departments include the costs of noise barriers in their proposed Federal-aid highway projects. The Federal share is the same as that for the highway system on which the project is located. Noise barriers are sometimes constructed without using Federal funds - for example, using only State, local, or private funds. 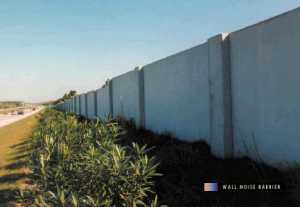 The costs of noise barriers are sometimes shared by governmental agencies and individual homeowners. How Does a Noise Barrier Work? Noise barriers reduce the sound which enters a community from a busy highway by either absorbing the sound, transmitting it, reflecting it back across the highway, or forcing it to take a longer path over and around the barrier. A noise barrier must be tall enough and long enough to block the view of a highway from the area that is to be protected, the "receiver." Noise barriers provide very little benefit for homes on a hillside overlooking a highway or for buildings which rise above the barrier. 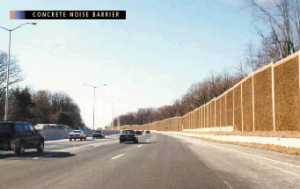 A noise barrier can achieve a 5 dB noise level reduction, when it is tall enough to break the line-of-sight from the highway to the home or receiver. After it breaks the line-of-sight, it can achieve approximately 1.5dB of additional noise level reduction for each meter of barrier height. 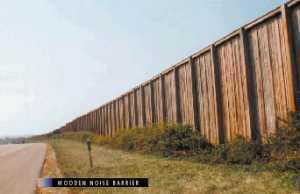 To effectively reduce the noise coming around its ends, a barrier should be at least eight times as long as the distance from the home or receiver to the barrier. Openings in noise barriers for driveway connections or intersecting streets destroy their effectiveness. In some areas, homes are scattered too far apart to permit noise barriers to be built at a reasonable cost. Noise barriers are normally most effective in reducing noise for areas that are within approximately 61meters (200 feet) of a highway (usually the first row of homes). What Type of Material Is Best for a Noise Barrier? 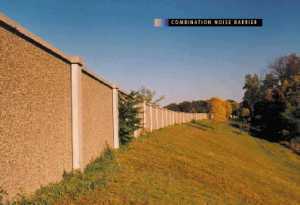 Noise barriers can be constructed from earth, concrete, masonry, wood, metal, and other materials. To effectively reduce sound transmission through the barrier, the material chosen must be rigid and sufficiently dense (at least 20 kilograms/square meter). All noise barrier material types are equally effective, acoustically, if they have this density. There are no Federal requirements specifying the materials to be used in the construction of highway traffic noise barriers. Individual State departments of transportation select the materials when building these barriers. The selection is normally made based on factors, such as aesthetics, durability, maintenance, cost, and the desires of the public. How Do People React to Noise Barriers? Overall, public reaction to highway noise barriers appears to be positive. However, specific reactions vary widely. Residents adjacent to barriers say that conversations in households are easier, sleeping conditions are better, the environment is more relaxing, windows are opened more often, and yards are used more in the summer. Residents also perceive indirect benefits, such as increased privacy, cleaner air, improved views and a sense of ruralness, and healthier lawns and shrubs. Negative reactions from residents have included a restriction of view, a feeling of confinement, a loss of air circulation, a loss of sunlight and lighting, and poor maintenance of the barrier. Motorists have sometimes complained of a loss of view or scenic vistas and a feeling of being "walled in" when traveling adjacent to barriers. A major consideration in the design of a noise barrier is its visual impact on the surrounding area. 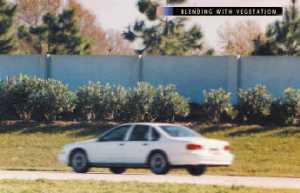 A tall barrier near a one-story, single family, detached residential area can have a negative visual effect. One solution to addressing the size relationship in visual quality is to provide staggered horizontal elements to a noise barrier to reduce the visual impact by planting landscaping in the foreground. Native plantings are preferable. 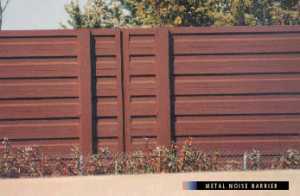 The visual character of noise barriers in relationship to their environmental setting should be carefully considered. In general, it is desirable to locate a noise barrier approximately four times its height from residences and to provide landscaping near the barrier to avoid visual dominance. 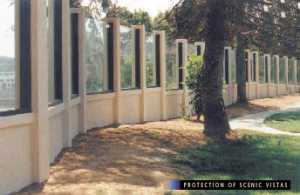 Noise barriers should reflect the character of their surroundings as much as possible. It is always desirable to preserve aesthetic views and scenic vistas, to the extent possible. The psychological effect of noise barriers on the passing motorist should be a part of barrier design and construction. Noise barriers in dense, urban settings should be designed differently than barriers in more open suburban or rural areas, and they should be designed to avoid monotony for the motorist. 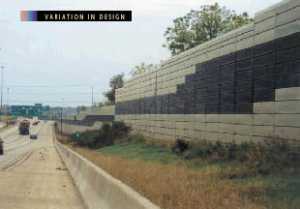 At normal roadway speeds, motorists tend to notice noise barriers overall form, color, and surface texture. A primary objective of noise barrier design should be to avoid a tunnel effect for the motorist. This can be accomplished by varying the forms, materials, and surface treatments. Graffiti on noise barriers can be a potential problem. One solution is to use materials that can be readily washed or repainted. 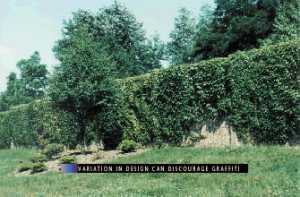 Landscaping and plantings near barriers can also be used to discourage graffiti, as well as to add visual quality. 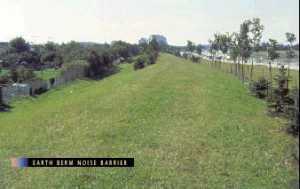 Does Construction of a Noise Barrier Increase Noise Levels on the Opposite Side of the Highway? Residents adjacent to a highway sometimes feel that their noise levels have increased substantially, because of the construction of a noise barrier on the opposite side of the highway. However, field studies have shown that this is not true. If all the noise striking a noise barrier were reflected back to the other side of a highway, the increase would be theoretically limited to 3 dB. In practice, not all of the acoustical energy is reflected back to the other side. Some of the energy goes over the barrier, some is reflected to points other than the homes on the opposite side, some is scattered by ground coverings (for example, grass and shrubs), and some is blocked by the vehicles on the highway. Additionally, some of the reflected energy is lost due to the longer path that it must travel. Measurements made to quantify this reflective increase have never shown an increase of greater than 1-2 dB an increase that is not perceptible to the average human ear. 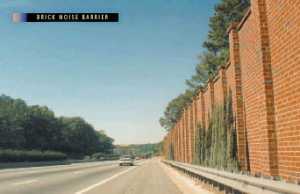 Does Construction of Noise Barriers on "Both" Sides of a Highway Increase Noise Levels? 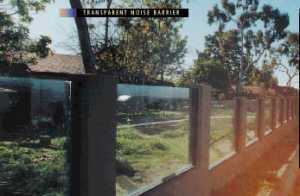 Multiple reflections of noise between two parallel plane surfaces, such as noise barriers or retaining walls on both sides of a highway, can theoretically reduce the effectiveness of individual barriers. However, studies of this issue have found no problems associated with this type of reflective noise. Any measured increases in noise levels have been less than can be perceived by normal human hearing, that is, less than 3 dB. Studies have suggested that to avoid a reduction in the performance of parallel reflective noise barriers, the width-to-height ratio of the roadway section to the barriers should be at least 10:1. The width is the distance between the barriers, and the height is the average height of the barriers above the roadway. This means that two parallel barriers 3 meters (10 feet) tall should be at least 30 meters (100 feet) apart to avoid any reduction in effectiveness. These studies have also shown that any reduction in performance can be eliminated through the use of sound absorptive noise barriers. Can Trees Be Planted to Act as Noise Barriers? Vegetation, if it is high enough, wide enough, and dense enough that it cannot be seen over or through, can decrease highway traffic noise. A wide strip of trees with very thick undergrowth can lower noise levels. 30 meters of dense vegetation can reduce noise by five decibels. 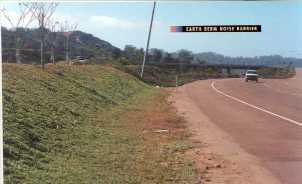 However, it is not feasible to plant enough trees and other vegetation along a highway to achieve such a reduction. Trees and other vegetation can be planted for psychological relief but not to physically lessen noise levels. Most residents near a barrier seem to feel that highway noise barriers effectively reduce traffic noise and that the benefits of barriers far outweigh the disadvantages of barriers. While noise barriers do not eliminate all highway traffic noise, they do reduce it substantially and improve the quality of life for people who live adjacent to busy highways. 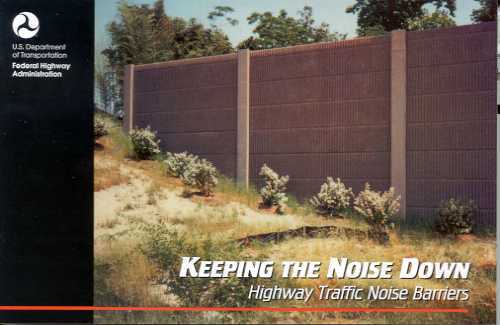 For more information on Keeping the Noise Down: Highway Traffic Noise Barriers, write to us at our e-mail address: environment@fhwa.dot.gov.